1 DISCLOSURE STATEMENT HCDC (Hamilton County Development Co., Inc.; dba: Horizon Certified Development Company) U.S. Small Business Administration 504 Loan Program The SBA 504 Loan Program offers eligible Small Business Concerns (SBC s) the means to finance expansion projects through a long-term, fixed-asset financing program. It requires the participation of a lending institution and provides up to 90% of a project s total financing requirements. The SBA relies on the services of a Certified Development Company (CDC) such as HCDC (Hamilton County Development Co., Inc.; dba: Horizon Certified Development Company) to administer and service the 504 Loan Program. HCDC wishes to advise you of certain charges and procedures relating to the Program s application, approval and funding processes. This Disclosure Statement highlights only certain routinely encountered issues and is intended for informational purposes only. It is not meant to be a complete summary of all SBA 504 loan policies and requirements. Each loan applicant is solely responsible for determining, understanding and following all 504 Loan Program policies and requirements. 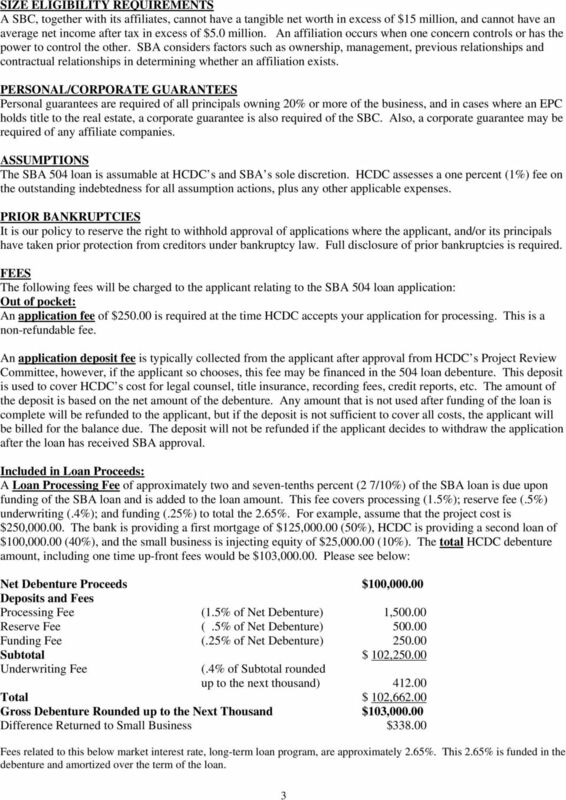 STRUCTURE OF PROJECT LOAN The structure of the SBA 504 loan would include the SBC choosing a consenting financial institution who would finance 50% of your project with mutually agreed upon terms. 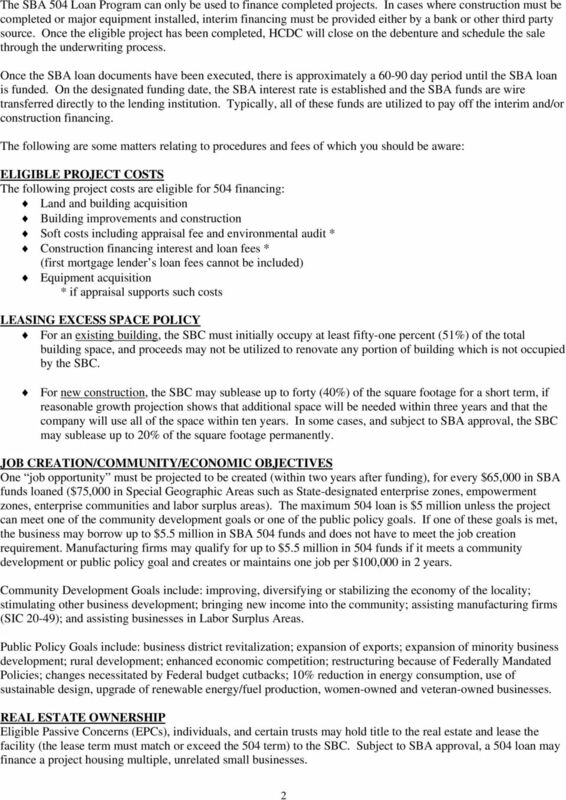 This lending institution would have a first lien position on the SBC s project assets. Because the 504 Loan Program was developed to provide long-term fixed asset financing, HCDC would provide a second, or subordinated, loan for up to a maximum of 40% of the total project costs at a fixed rate and term of 10 or 20 years on real estate or machinery and equipment. The small business must provide a minimum of 10% of the project costs as an equity injection. Note: If the small business concern has been in business for two years or less, or, if the project being financed involves a limited or singlepurpose building or structure, the small business must provide at least 15% of the project costs as equity. If the small business concern has been in business for two years, and, the project being financed involves a limited or single-purpose building or structure, the small business concern must provide at least 20% of the project costs as equity. 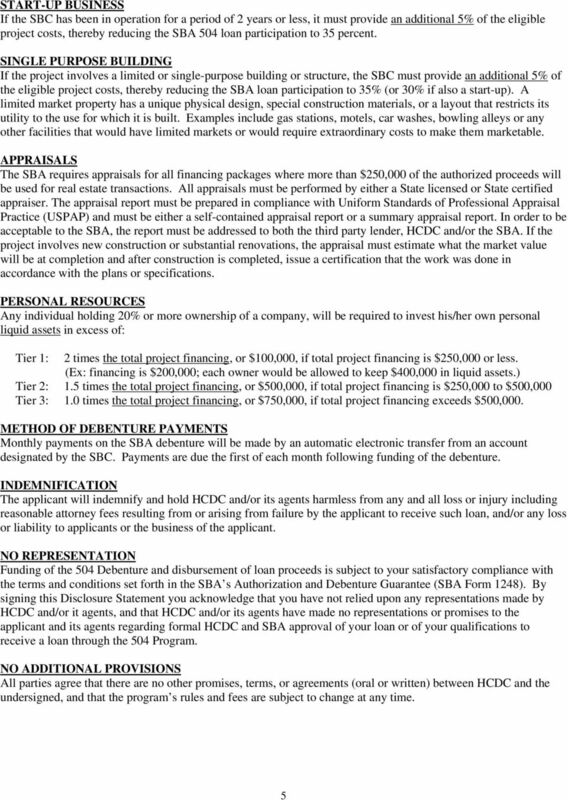 To raise the Certified Development Company funds representing the subordinated SBA 504 loan, HCDC issues a debenture that is 100% guaranteed by the U.S. Small Business Administration. The guaranteed debenture is pooled with other similar debentures from Certified Development Companies around the nation through an underwriting process and then sold into the secondary market on a monthly basis. It is the secondary market selling price that determines the interest rate to the small business on the Certified Development loan. It is noted that the interest rate for 10 and 20 year 504 debentures are based on 5 and 10 year Treasury rates, respectively. The 20 year 504 debenture is sold on a monthly basis, and the 10 year 504 debenture is sold on a bi-monthly basis. Although Treasury rates are used as a basis, investors typically expect a premium over the base treasury rate, reflecting current market conditions. 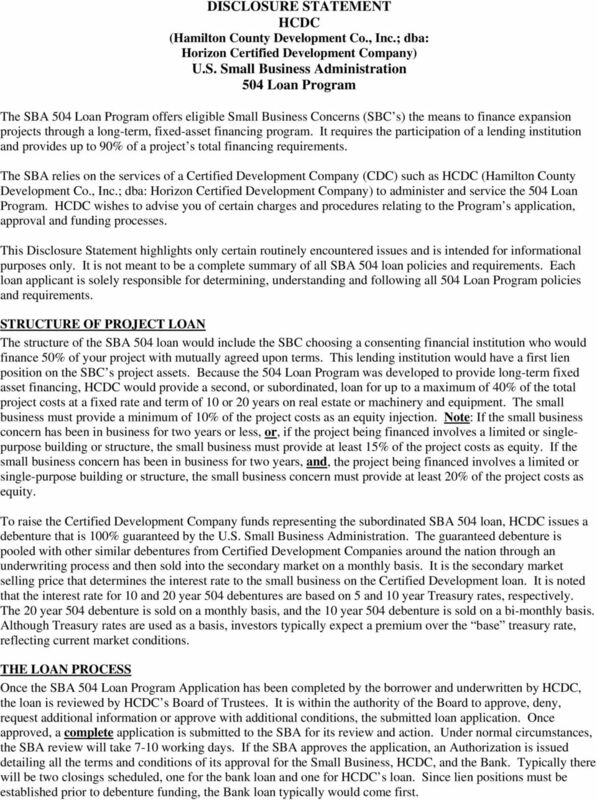 THE LOAN PROCESS Once the SBA 504 Loan Program Application has been completed by the borrower and underwritten by HCDC, the loan is reviewed by HCDC s Board of Trustees. 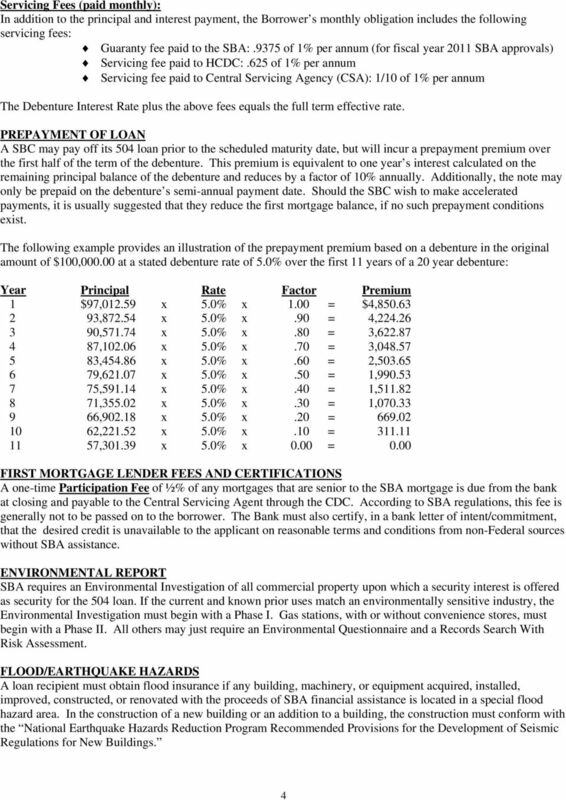 It is within the authority of the Board to approve, deny, request additional information or approve with additional conditions, the submitted loan application. 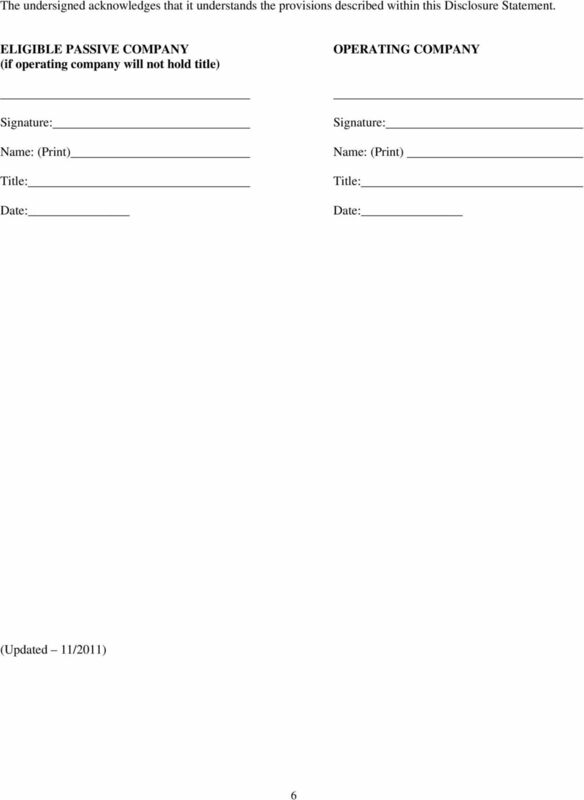 Once approved, a complete application is submitted to the SBA for its review and action. Under normal circumstances, the SBA review will take 7-10 working days. If the SBA approves the application, an Authorization is issued detailing all the terms and conditions of its approval for the Small Business, HCDC, and the Bank. Typically there will be two closings scheduled, one for the bank loan and one for HCDC s loan. Since lien positions must be established prior to debenture funding, the Bank loan typically would come first. The SBA 504 Program: Details, Benefits, Challenges and How to Get Involved January 29, 2015 Mark Abell, SVP & SBA Division Manager Vectra Bank Colorado What do you picture when you hear Small Business? VISION INCREASING OPPORTUNITIES FOR ALL SMALL BUSINESSES TO SUCCEED SBA FINANCIAL ASSISTANCE An SBA guaranty is designed to help small businesses get access to reasonable credit from commercial lenders. Accounts payable Money which you owe to an individual or business for goods or services that have been received but not yet paid for.